The setup for download into CFI-compliant memory is different from the one for internal flash. Initialization of the external memory interface the CFI flash is connected to, is user’s responsibility and is expected by the J-Link software to be done prior to performing accesses to the specified CFI area. Add the device specific initialization of the external memory controller to the J-Flash init steps which are part of the project (Project settings -> MCU -> Init steps). Setup the Base Addr and the Organization of the CFI flash according to your setup. 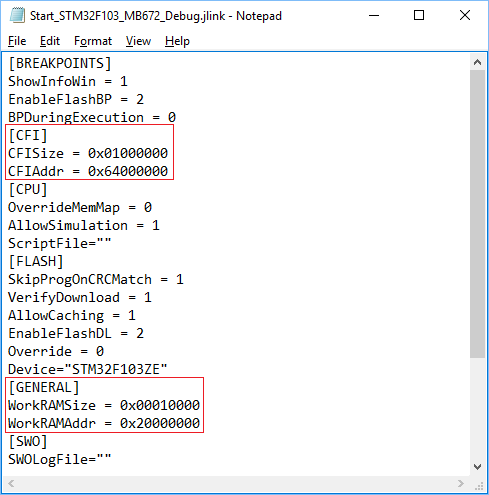 Alternatively the method in the beginning of this article (Generic - via J-Link script file) can be used to initialize the CPU. After this the file should look similar to the sample in the following screenshot. Save the settings file and restart the debug session. This page was last modified on 21 January 2019, at 19:13.